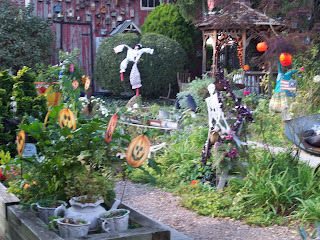 Ahhh, the end of October... it's Halloween and the gardens are decked out in the seasonal finery. 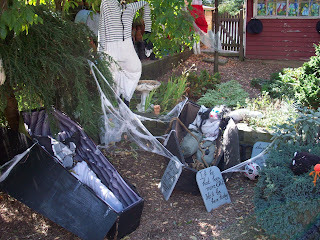 Every year, our Jim Thorpe sister creates a Halloween character, and when the season is over, we 'inherit' the character for our gardens. 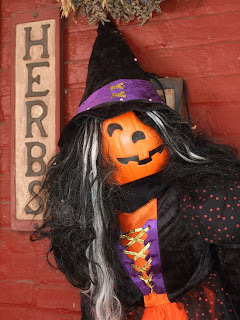 This herbal witch is one from years past, and we are glad to welcome her to our garden. 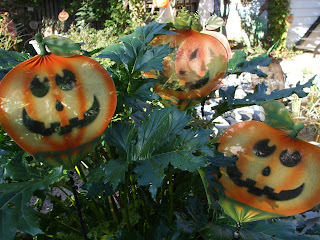 Last night was Trick or Treat, and these glowing pumpkins with personality lit up the backyard, welcoming all to the gardens. Tonight is our annual Garlic Dinner, the neighborhood is already beginning to smell of the 'stinking rose'. Cedar went on a Kindergarten Field Trip recently to Paulus Farm Market where they got to pick apples, pumpkins, gourds and play in a corn maze. Course the tractor ride and the bus rides were the real highlight for Cedar. He came home with this little coloring book about gourds published by Pyramid publishing that was very interesting. It covered the wide variety of gourds and some of there very many uses: as instruments, bird houses, bowls, masks and even as floats that served as water wings. This page is just one of the games in the book. Ricinus communis, a tropical ornamental plant, grown as an annual in southcentral PA, and will reach only about 10 feet in height. 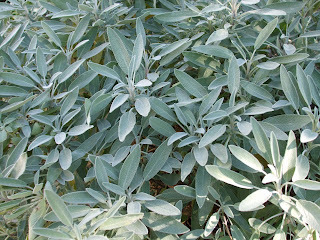 A large fast growing plant, it provides a lovely foliage screen over the summer months. Shown here are the flowers. The fruit which follows is a capsule containing three large seeds which are the source of commercial Castor oil. The dark seeds are shiny and extremely poisonous. Castor bean oil is one of the best known laxatives and probably one of the least liked. Old timers remember its yucky flavor and odor but this is the new millennium and Castor oil now comes both tasteless and odorless. Its laxative action is gentle and suitable for children and the aged. Castor oil is one of the most water soluble oils available so it is useful in making a scented oil to add to the bathtub. Simply mix 1 C of some of the tasteless/odorless Castor oil together with 1/4 ounce of your favorite essential oil such as lavender or lemon. Voila, a quick, easy and fun holiday gift! And the Winners Are. . . . .
. . . . . . . Lemon Verbena Lady won the Sweet Remembrances Cookbook with several Rosemary House herb packets and La Tea Dah won the Rosemary House Afghan! All the names were tossed into a rattan teacup, and these two munchkins, with their eyes closed, each picked a name from the cup. It had been predetermined that Angelica was selecting the afghan winner and that Cedar was selecting the cookbook winner. Congratulations to our winners! Please contact us at therosemaryhouse@aol.com with your mailing address so we can send these off to you. Thank you to all who participated - we appreciate the support you have shown us over this past year. All your comments of encouragement and gratitude are acknowledged with heartfelt thanks. 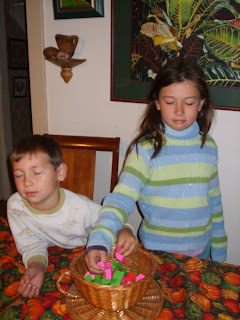 When we first started blogging, we felt that we were the only two reading the posts! You have shown us that we have readers scattered across the US and beyond, and to those of you that live close enough to attend our events, we appreciate that you let us know you are reading and enjoying the journey we share. Boscage is an old French word for a mass of trees or shrubs; wood, grove, or thicket. And, indeed, we have a bosky patch of land. We have done a lot to it over the past 24 years, but every time I look, there is more to do. It is compelling and giving shape to my retirement years. We have left most of the property wooded. 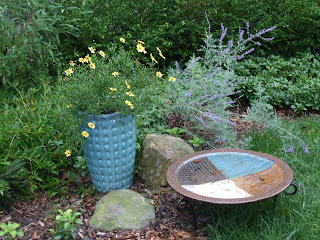 Over the years we have fenced in a series of raised beds, cleared some of the shrubby growth away from the stone walls, installed a mucky little pond for the spring peepers,and established garden beds around the house. Two years ago, we put an addition on the front of the house and changed the foundation planting. Now I am making lazy beds in the front yard and planning gardening projects for next spring. The expanded deck on the side of the house is almost done and I have plans for planting around it. 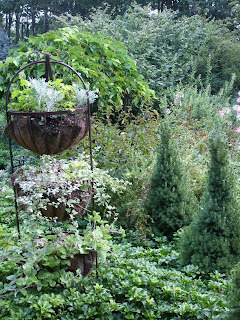 How to garden on the edge of a woods challenges me. First, the woods harbor deer. As you know, they make their rounds nightly. I am not interested in fencing the property although I am planning new kinds of ways to fence off smaller patches inside the vegetable/nursery garden. The 5' fence surrounding those beds was effective only when we had a dog. Deer can jump 8' from a standing position. I understand that that they are leery of a series of barriers and that is what I intend to create. I am not interested in spraying my plants to discourage the deer. My primary defense is to plant deer-resistant plants. My garden, like any garden, is always an experiment. The second challenge is the invasive plants: garlic mustard, Japanese stiltweed, oriental bittersweet, barberry, and Winged Euonymous. Japanese stiltweed seems to be winning. This year I am aggressively addressing this problem. 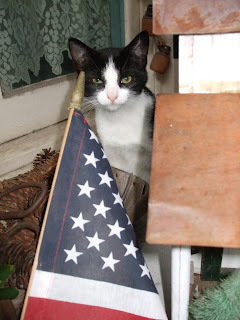 I am trying to wipe out the plants before they seed. If only I could convince the deer to eat these plants! The third challenge is to keep the yard and garden manageable. I am not getting younger and I am concerned about creating something that I can't manage in the future. 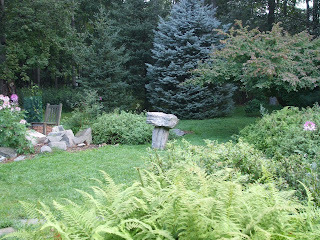 In my favor, and one of the joys of Westchester (NY), is the lack of manicured lawns and gardens. Thank you Carrie for this journey through your peaceful surroundings that provide tranquility to all those that happen by. The gardens are a fright at this time of year and it is not all because of the weeds and the overgrowth...... They are particularly creepy at dusk. My favorite part is always the epitaphs on the tomb stones. 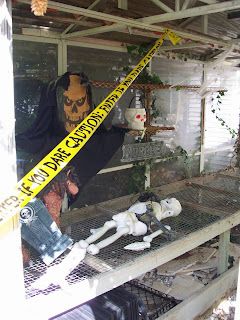 "If he had been more SAGE, he'd still be here today"
"They were such FUNGI's, so sorry they're gone"
"Bones and Marrow, Here lies YARROW"
"HERB in our hearts forever"
This year the greenhouse interior was particularly ominous. Agastache foeniculum or Anise hyssop is a beautiful plant in the garden with a delicious licorice taste especially fun to use in tea. The flowers dry nicely holding both their flavor and color for use in wreath crafting. It is a perennial growing to about 3 feet in height. Considered a short lived perennial you will have to replace it every 5 years or so. It is quite hardy growing as far north as Wisconsin and Vermont, in fact it tends not to perform as well in the South due to the intense summer heat. This beautiful garden plant blooms in late July and August. Bees and Butterflies love it. This little sweetie was discovered during a recent adventure to Jim Thorpe, PA. 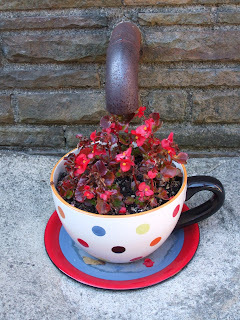 The oversized tea cup planter is tucked underneath a spring fountain. 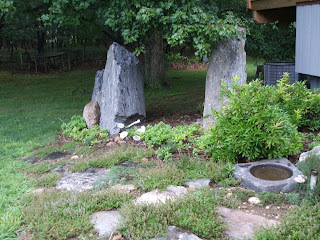 When our sister first moved to Jim Thorpe, this fountain was a source for pure spring water. We would lug empty bottles to this faucet to fill them up. Alas, it has since dried up, and the drain has been replaced with this pretty floral display. A tea cup would catch my eye and tickle my fancy! 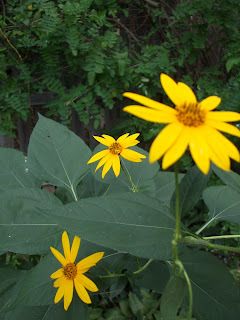 What native American plant has an edible tuberous root and is a close family connection to the sunflower? Give up? The so-called Jerusalem artichoke! Not from Jerusalem and certainly not an artichoke, how could we have perpetuated such an appalling misnomer? Since our country’s beginnings when the Spanish called it girasole, their word for flowers attracted to the sun (now loosely translated into Jerusalem), this plant has been misrepresented by its own name. Called artichoke because the early settlers compared its flavor to globe artichoke, it is properly Helianthus tuberousa, a name meaning tuberous rooted sunflower. Sunny flowered it is, blooming now from Nova Scotia to Georgia you can spot it easily. 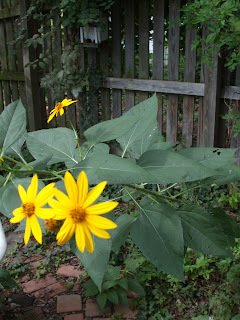 Even our gardening-challenged neighbors have pointed and said “What’s that plant?”. The edible tuberous roots are starch free and contain inulin, a carbohydrate the body converts into a natural form of sugar making them particularly valuable in all diets especially diabetic or other restricted diets. Pseudo-potatoes, mild and flavorful, they can be made into delicious dishes by preparing them the same way you would the more popular potato. Smaller, only two to four inches or so they are also slightly lower in calorie count and have their own flavor, so don’t compare them to other veggies. Steam them, boil them, cook with an oven roast for 30-45 minutes or fry them. They mix well with green vegetables, giving a crunchy texture many find highly desirable. Saute the sliced sunchoke roots with onions in oil for a few minutes then stir fry in some chard, spinach, beet greens or broccoli for an epicurean dish. Season as you wish with salt and pepper or a bit of garlic, savory and a touch of mint is nice or try a dash of nutmeg for indefinable goodness. Bake them, add to casseroles, cream of celery soup, slice thinly for salads, pickle them, or cut as crudites for dips. Their nut like flavor is similar to water chestnuts. The beauty of sunchokes is they are ridiculously easy to grow. Sun or shade, rich or poor soil, wet or dry places, weeded or cultivated, they always produce a crop. Once planted you will always have them for they are remarkably hardy, pest free and easily propagated. Strong perennials, sometimes growing to 12 feet tall, should be planted a foot and a half apart in an out of the way corner where they will make an effective screen or summer hedge. 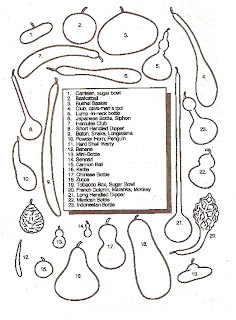 You must harvest them or tubers left in the ground will multiply and get out of control. That’s a word to the wise. Growing easily everywhere, this wildflower can be left in the ground until needed so storage is no problem. No need to spend precious energy processing or freezing sunchokes. When you dig them , you can count on a pound of the knobby tubers per plant. It’s easy enough to perpetuate your supply by leaving the smallest ones in the ground for next years harvest. Known to the Native Americans as “Askibwan” a name not likely to catch hold (meaning “raw thing”) they taught the colonists to use the roots as food. Even if you choose not to nibble on the root the golden yellow daisy like flowers, more a floppy daisy than a sunflower, and always growing in a cluster of three are a pretty bonus to the garden. Pick them now for an enjoyable fall flower arrangement with no damage to the crop. One Year Anniversary ~Blog Giveaway! In anticipation of our one year blogging anniversary, we have selected two gifts to give away to our loyal readers! 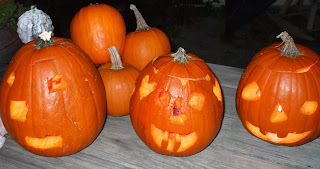 We started our blogging journey on October 28th of last year. 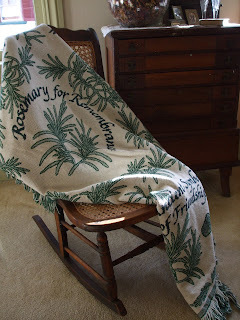 We are excited to share two of our favorite Rosemary House products with our friends. Susanna has selected this beautiful comforter; exclusive to The Rosemary House, as her choice. 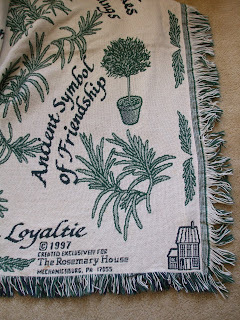 It features the many different uses of her favorite herb, Rosemary, sacred to marriage, bees love it, ancient symbol of friendship, and for remembrance of course. There's even a small Rosemary House logo in the corner. Nancy is offering a copy of her Recipe Collection which features 200 tried and true recipes that have been served and enjoyed in the tea room during the first 15 years of operation. She will also include two original Rosemary House products - Roastmary and the Mayor's Magic Mustard Mix. These two seasonings are used in several of the recipes. Capture the excitement of cooking with herbs! Beginning this week, thru midnight (EST) October 27th, any one who posts a comment on any blog post will have their name tossed into the hat for the drawing of these two gifts. Post as many times as you like - each comment is an entry into the contest. On October 28th, two names will be drawn from the hat. The first name selected will win the comforter, and the second name selected will win the cookbook and herb seasonings. We will announce the winners on Oct. 28th; our First Year Anniversary post. Unless you have a Google/Blogger identity, please include your initials and/or name, city and state, in the post so we will be able to distinguish you from other participants. This is a piece of ginger root which you can easily grow at home as a houseplant. I find that it starts best if laid on a pot of soil, watered and then put in the dark (like in a cellarway or in a brown paper bag). It takes about three weeks for your ginger root to sprout out but then it will grow into a lovely houseplant and you will be able to harvest a piece of the root here and there for some freshly grated ginger. Medicinally, ginger is terrific for nausea and our sister swears by it for motion sickness. She takes two capsules of powdered ginger an hour before the trip, one capsule halfway through the ride and one at the end of the trip. Love it!! Many folks refer to herbal teas as tisanes. My Websters defines tisane as an infusion (of dried herbs) used as a beverage or for medicinal effects. Most tisanes are naturally caffeine free, the exception being Mate from South America. This herb, with the sign nestled among a healthy crop of blooming anise hyssop certainly would provide refreshment on a hot sultry day. We visited the vegetable and flower garden of a pre-school over the summer where each child tended their own garden plot. Aren't these labels the children made so clever and unique? This cute little guy has become a finicky eater of sorts. He knows what he wants, and that's that. If we suggest otherwise, it's a lost cause, and he eats nothing. Tonight for dinner, he was interested enough to sample the corn fritters I made - because 'I've never eaten a corn pancake', says he. In addition, we had chicken which I dotted lightly with butter, sprinkled with dried onion, paprika, parsley, and garlic and baked it in a 350 degree oven for 45 minutes. Tonight, Cedar specifically requested some of the chicken, and then proceeded to request an additional piece of the chicken 'with the plants on it'. You just never know when they will eat the plants and when they will not. 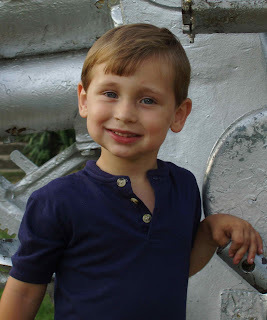 When his older brother was younger, he announced that he doesn't like herbs as he's simultaneously eating a portion of mashed potatoes seasoned with fresh chives. Yesterday was SereniTea Wednesday, where we are open to the public for Afternoon Tea. Our menu started with homemade Potato Dill Soup, a creamy flavorful blend of potatoes, celery, onions, dill and thyme. The middle tier featured the oven fresh scones; traditional English cream and Lemon Currant served with orange slices and fresh figs from our fig tree. Mock clotted cream and strawberry jelly. The dessert layer included chocolate zucchini brownies, apricot sage cookies, and pumpkin mousse. Endless pots of properly brewed loose leaf tea are enjoyed throughout the day. This event repeats itself every Wednesday (by advance reservation); but the menu is always varied! A unique blending of dried apricots and fresh sage forms the flavorful combination in this chewy cookie. Preheat oven to 350 degrees. Lightly grease 2 baking sheets. Cream butter, sugar, and egg until smooth. Sift in flour and baking soda. Add apricots, sage, cornmeal, and salt, blending until combined. Drop mixture by teaspoonfuls onto baking sheets, about 1" apart. Bake for 10 - 12 minutes until golden brown. Transfer cookies to a cooling rack. Yield: 2 doz. 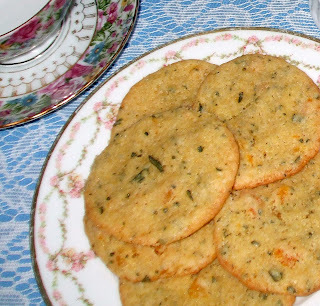 Fresh garden sage is the base for this flavorful cookie. This recipe was shared by LaDonna from Gracious Hospitality. 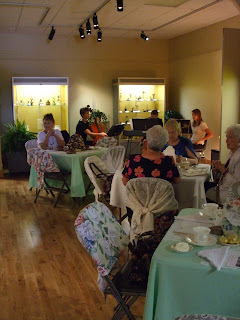 Recently, A Victorian Tea was presented by the Volunteers of The Mechanicsburg Museum Association. They amazingly transformed the Freight Station Museum into a 'tea room' for the day. 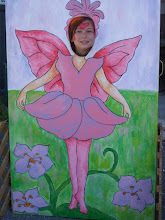 It was obvious that a lot of preparation and coordination went into this fundraising effort. 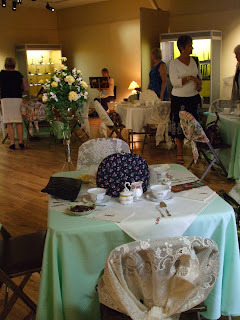 The tables were set with beautiful china and silver patterns; there were tea cozies on each table (available for purchase in the gift shop after tea) and they even decorated the chairs with assorted chair back covers. The scene was set with the beautiful tables, the greenery provided by the Garden Bouquet (a local florist), and musical entertainment by The Praise Trio. What a very special afternoon to remember. Steaming hot pots of Darjeeling Tea were presented to each table to mark the beginning of the event. 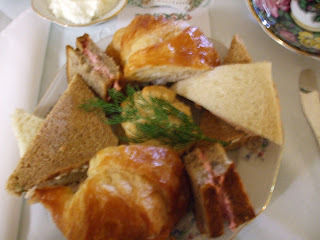 This was followed by individual plates of Chicken Waldorf Salad on Croissant; Smoked Salmon on Whole Wheat; Cucumber with Veggie Cream Cheese on White; and James Beard Cream Biscuit served with clotted cream (mock) and Strawberry Preserves. All hearty portions, two servings of each sandwich! 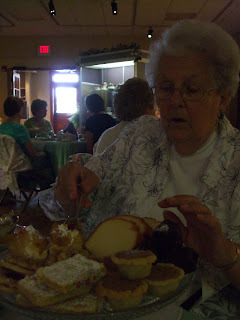 The dessert plate included Lemon Bars, Chocolate Squares, Pound Cake Slices, Dainty Cream Puffs, and Pecan Tarts. Many 'to go' bags were filled with the desserts. Before heading home, the guests enjoyed viewing the tea themed memorabilia that was on display in the many cases. Kudos to the committee of volunteers that coordinated this community event. It was an afternoon to remember. 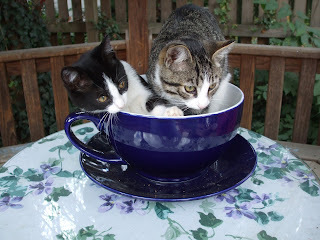 One Saturday afternoon, I ventured out to our gazebo to gather this large blue teacup to wash it, when lo and behold, paws were poking out from under the tablecloth. This pair of kittens was nestled under the table, oblivious to the world about them. And we were oblivious to their existence for several weeks. 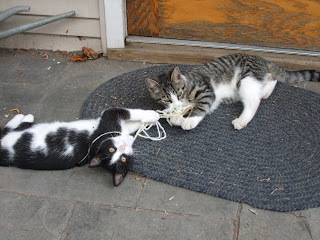 We have, of course, started to feed them, cuddle them, pet them, and otherwise adore them, to the point that they have now become 'our' kittens. They have free roam of the gardens, and have learned where to access the cat food. They scamper, chase their tails, climb up the dogwood tree, snooze together, catch flying insects and provide entertainment. Just wait until we introduce them to fresh catnip! 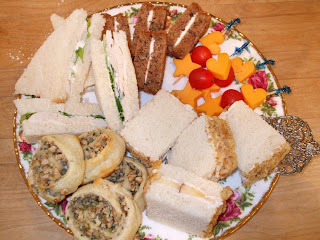 "The Golden Age" Ginger Joy and crackers, Step Back in Time Lemon Caesar Salad, Just Ducky Chicken & Ham Sandwich, Hotsy-Totsy Ham Salad in Corn Muffins, Swanky Herbed Party Sandwiches, Nifty Cheese Bacon Puffs and Ritzy Shrimp Tea Sandwiches. Traditional Cream Scone served with cream and jelly along side Orange Pineapple Ambrosia. Dessert included The Bee's Knees Peanut Butter Cups, Puttin' on the Ritz Chocolate Streusel Bars and All Dolled Up Cream Crunch. We were pleased to welcome Alice Dupuy as she shared delightful stories about the reckless jubilance of the 1920's.